Before Iraq was conquered by the Arabs in the seventh century, it was one of the oldest centers of Christianity in the world. Even after the Arab conquest, Christians made up a sizable minority of the population – sometimes tolerated, sometimes persecuted, but always surviving. Now it’s facing its biggest threat in centuries. The Christian Community in Iraq is a lot smaller than it was in 2003 when the Coalition invaded. During the occupation, radical Muslims claimed the Christians were helping the invaders and used this as an excuse to attack them. Churches and shops were bombed and individual Christians were murdered or told to leave on pain of death. In an interview with the BBC, the priest at St Joseph’s Chaldean Church in Baghdad said that in the past nine years his parish has shrunk from 1,200 families to 300. The New York Times reports that before the war the Christian population was estimated to be as high as 1.4 million, and has now dropped to less than 500,000. I met few Christians in my 17 days in Iraq other than some shopkeepers and the owners of a liquor store when I went on a beer run in Basra. I was anxious to see some of the early medieval centers of Christianity that make the country so important to Church history. The Christian community in Iraq is splintered into more than a dozen different churches, including the Assyrian Church of the East, the Syrian Orthodox Church, the Syrian Catholic Church, the Armenian Apostolic Church, and many more. Many of their rites and beliefs are from a markedly different religious tradition than what we are familiar with in the West. Above is a photo of the entrance to Mar Mattai monastery, run by the Syrian Orthodox Church. Located in Kurdistan in the far north of the country, it sits on the slopes of Mt. Maqloub. It was founded in 363 A.D. by the Saint Mar Mattai and is thus one of the oldest monasteries in existence. Much of the monastery is modern, with a few crumbling ruins dotting the slopes to hint at its long history. The assistant abbot welcomed us in careful, practiced English and told us how the saint converted Prince Behnam and Princess Sarah from paganism to Christianity. Sarah had been suffering from leprosy and was miraculously cured after her conversion. %Gallery-172437%When their father King Senchareb found out, he had them put to death. He soon regretted his act, became a Christian himself, and as penance built Mar Behnam Monastery. This monastery is much better preserved. Its stone interior is intricately carved in the style of the Atabek Emirate, which lasted from the 11th to the 13th centuries before being wiped out by the Mongols. The style is a strange one: a sort of mix of Turkish design with Christian symbolism and elements from ancient Assyrian art. See the gallery for some images, and there are more at this site. St. Behnam monastery survived the Mongol invasion and even managed to make a few converts. Some of the inscriptions in the crypt are in Mongolian. Walking through these two monasteries I could feel the absence left by the departure of so many from the community. We saw almost no one, and the monasteries felt more like museums than places of worship. Perhaps we just went on quiet days. Both are centers for pilgrimage, though, so I was hoping to meet and talk with pilgrims like I had at the Shia holy places. But it was not to be. While the situation for Christians, indeed all Iraqis, has calmed down considerably in the past couple of years, the persecutions continue. Iraq has broken down along sectarian lines, with Sunni and Shia Muslims fighting it out and Christians being targeted by radical Muslims. Being such a small minority, it’s difficult for the Christian community to defend itself. Government soldiers and police guard churches and monasteries, and man checkpoints at the edges of Christian neighborhoods, but as with sectarian attacks against Muslims, the terrorists often find a way to hit their targets. There’s hope, though. As we studied the inscriptions in the crypt of St. Behnam’s monastery, I noticed our guide and one of our guards, both Muslims, lighting candles. I went over to the guide, who I knew to be a devout Shia, and asked him why he was lighting candles in a Christian holy spot. “In my office there are a lot of Christian women. They asked me to light candles for them,” he replied as if it were the most natural thing in the world. This man, who went off to pray every time we visited a mosque, saw no conflict with his faith in doing this or with working with Christian women. If his tolerance can become common enough to push out the intolerant radicals, the Christian community in Iraq may survive after all. Iraq is an ancient land. It’s seen a lot of civilizations come and go and each one has left behind spectacular monuments and rare treasures. On a recent visit, I had the privilege to experience many of these sites. Last time, I talked about the monuments of the Assyrian Empire. Today, I want to talk about three more of Iraq’s ancient wonders. Perhaps the most famous is Babylon. It was the political and spiritual capital of southern Mesopotamia starting with the ruler Hammurabi (ruled 1792-1550 B.C. ), the same king who created the famous law code. The city had its ups and downs but reached a peak under Nebuchadnezzar II (ruled 604-562 B.C.). Babylon was home to the fabled Tower of Babel and the Hanging Gardens. Equally impressive were its city walls, which stretched for 8 kilometers. The ancient Greek historian Herodotus said they were wide enough on top to allow a four-horse chariot to turn around. The gate was excavated by a German team in the early 20th century and carted back to Staatliche Museen in Berlin. The gate at Babylon today is a modern reconstruction, and it’s not even full size. Far more impressive are the city walls, also reconstructed, and the original processional way, which, like the Ishtar Gate, is decorated with strange beasts. Part of the original street level of the processional way remains – a flat surface of bitumen, an early form of asphalt. Strange to say, I found this simple stretch of pavement one of the most evocative sights in a country filled with ancient treasures. People walked along here more than 2,500 years ago, and there it was, stretched out before me. I desperately wanted to vault over the fence and stroll down the road, but even Iraq’s archaeological sites have guards and regulations. What a pity. Babylon’s reconstruction was done under the rule of Saddam Hussein, who fancied himself one of the great kings of Mesopotamia. He got the cruelty part down pat, but missed out on the greatness. He couldn’t even do a decent reconstruction. Against the advice of the archaeological community, he built the new walls atop the originals and obliterated much of the ancient remains. In true ancient style he had bricks bearing his name used in the building. And now in true ancient style, his people have been busy erasing his name ever since his inglorious end. One of Saddam’s palaces stands on a hill overlooking the site – an empty shell. When Babylon was enjoying its heyday, the Sumerian city of Ur was already ancient. Its foundation is lost in time, stretching back at least seven thousand years. The city grew steadily and became the center of the most sophisticated civilization the world had yet seen. Writing thrived here, with scribes producing countless clay tablets written in cuneiform, a complex script of wedge-shaped impressions. The first dynasty of Ur, starting in the 26th century B.C., was hugely wealthy and powerful. Some of Sumer’s best-known treasures come from the royal tombs dating to this period, such as elaborately decorated harps, the Royal Standard decorated with scenes of war and peace, and delicate gold jewelry from the queens, princesses and their female servants. The British Museum now owns many of them. Click the link for an amazing slideshow. The Third Dynasty was even greater than the First and saw a flourishing of the arts and science. It also created the first known law code, the Code of Ur-Nammu, 300 years before the Code of Hammurabi. 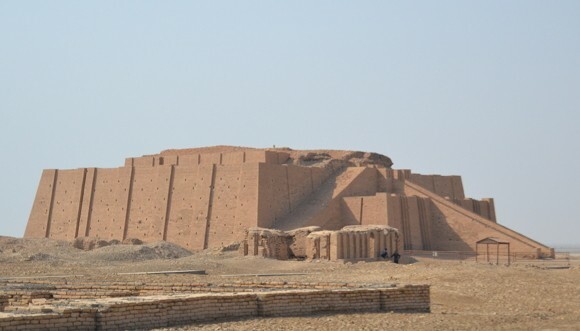 This dynasty completely rebuilt Ur and also put up the Great Ziggurat, pictured above, which got a modern facelift courtesy of Saddam Hussein. One archaeologist I met back in the U.S. told me that during the war, Saddam parked some of his fighter planes next to the ziggurat, hoping they’d be safer there than in the nearby air force base. They got strafed by an A-10 and some of the bullets hit the ziggurat. I intended on checking for bullet holes but got so entranced with where I was that I forgot to. Maybe next time. Zipping forward several centuries we come to Ctesiphon, the capital of the Parthian Empire in the first century B.C. and later the Sassanid Persian Empire. All that’s visible today is the Taq-i Kisra, shown below. This was an iwan, or great hall, built by the Sassanids in the sixth century A.D. The building was a royal winter residence and it was here in the iwan that this king would sit on his throne and rule his kingdom. The giant brick vault soars 110 feet into the air and used no reinforcement. It’s the largest of its kind ever built and despite all the years and wars and invasions, it’s still standing. All of these sites and many more have suffered from looting and neglect in the tough years since the invasion. Luckily, a dedicated band of Iraqi and foreign archaeologists have been busy preserving them. New excavations have started and hopefully, as more incredible finds are uncovered, Iraq’s ancient past will come to light. This Iraqi policeman is busy texting at one of the great archaeological sites of his country – Assur, the first capital of the Assyrian Empire. Assur was founded at least as early as 2400 B.C., but it wasn’t until the reign of the Assyrian king Shamshi-Adad (ruled 1809-1776 B.C.) that it became the capital of a true empire. Shamshi-Adad’s armies took over the bulk of Mesopotamia, as well as Syria and Asia Minor. By then Assur was a magnificent place, having had centuries of kings lavishing it with attention. Several large temples dominated the site, including one for the goddess Ishtar and another for the city’s god Assur, who rose to become one of the most important gods in the Assyrian pantheon thanks to the city’s fortunes. Rising above all was a ziggurat, a stepped pyramid atop which once stood a temple. Shamshi-Adad’s conquests weren’t to last and the empire soon fell to the Babylonians. The Assyrian Empire had to be rebuilt by later kings. Like with many Mesopotamian sites, Assur is in a sad state today. The land has very little stone, so most buildings were constructed with mud brick, which has a bad habit of melting away in the rain, even the sparse rain of Mesopotamia. Thus the ziggurat looks like a big lumpy hill, and we can only see the foundations of the temples and palaces thanks to the meticulous excavations of generations of archaeologists. Despite the poor preservation, there’s still a magical quality to the place with the Tigris River flowing lazily by and so much history underfoot. %Gallery-171929%Another important Assyrian site is Nimrud, established as the imperial capital by King Ashurnasirpal II (ruled 883-859 B.C.). His palace was decorated with lively bas-reliefs showing him hunting, vanquishing his enemies. This site has more to see thanks to the intact stone carvings and several reconstructed buildings. A pair of giant, winged bulls flank the entrance, and several important carvings still line the walls. Sadly, one that showed the king standing before a sacred tree with the god Assur hovering above was smashed and parts of it stolen during the looting that took place during the 2003 invasion. The Assyrians have the reputation of being the bullies of the ancient world, always ready to lay waste to a city, salt the fields, and flay their enemies. This is partially due to their unsympathetic treatment in the Bible and partially to the magnificent bas-reliefs they carved to show off the bloody results of their conquests. The Assyrians were great warriors, but they were no more cruel than any other ancient empire and they achieved a high level of artistic development. They also valued learning. At Nineveh, another Assyrian site in Iraq, archaeologists discovered a vast library filled with texts on astronomy, medicine, geography and history, as well as the day-to-day functioning of the empire. Ancient classics such as “The Epic of Gilgamesh” were copied and read, and new works were written. Far more than simple thugs, the Assyrians were one of the great empires of the ancient world. If you can’t make it to Iraq, several museums in the West have excellent Assyrian collections, including the British Museum in London, the Louvre in Paris, and the Met in New York City.